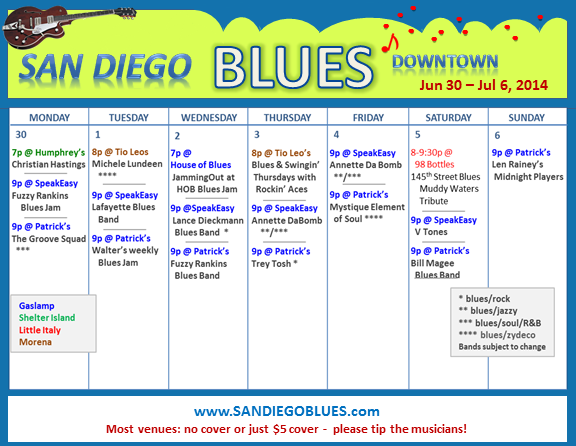 This week San Diego blues band, 145th Street, is doing a tribute to Muddy Waters over at 98 Bottles in Little Italy, which should be lots of fun. 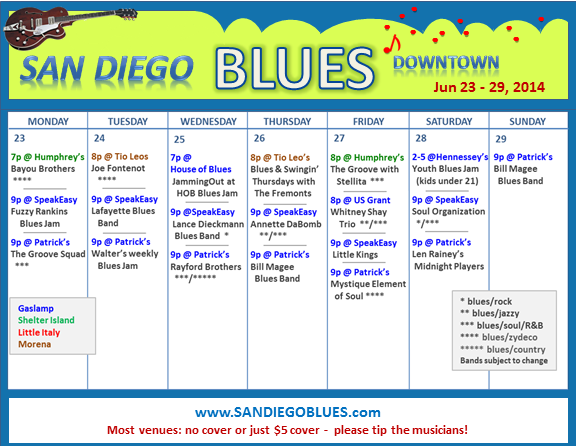 We also have the usual jams and bands playing in the Gaslamp, and once again this week at Patrick’s it is primarily blues. Humphrey’s has cut back on the blues I’m sad to see, but Kona Kai Lounge reopens this week and in another week will have blues back in their calendar, including R&B blues singer Missy Andersen! 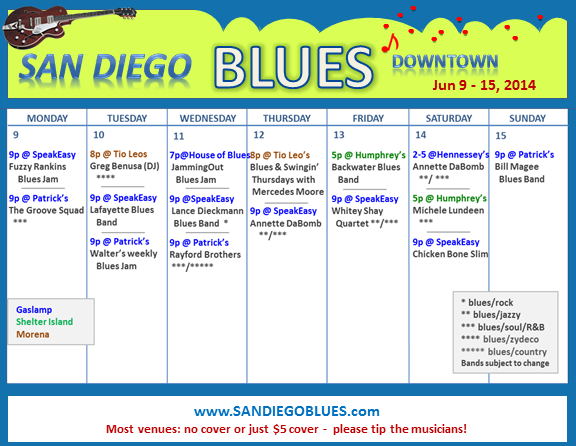 This is a pretty typical week for San Diego blues around town, although it is light at Humphrey’s Backstage on Shelter Island. But in another week, Kona Kai Lounge should be open again and hosting regular blues bands. 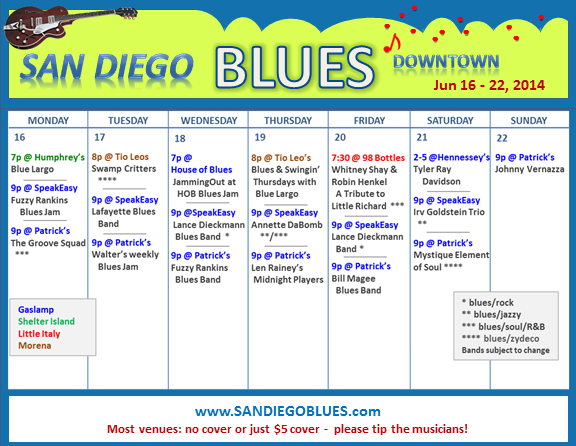 Patrick’s has mostly blues this week, which means there is live blues music every day of the week. Enjoy! 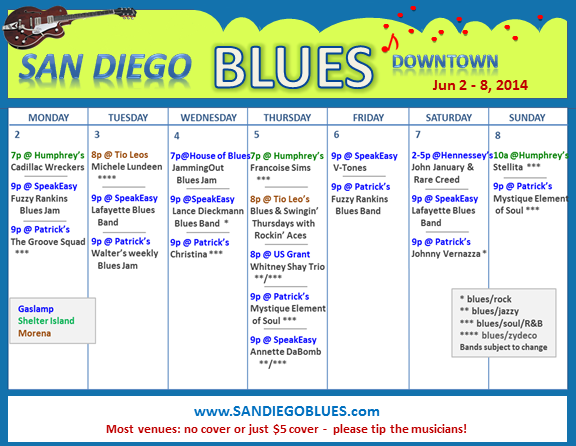 It is a pretty typical week for downtown San Diego blues, with most of it happening at the SpeakEasy and Patrick’s in the Gaslamp. Hopefully Kona Kai’s renovations will wrap up soon on Shelter Island, and they will resume their schedule of blues a few times a week. It is a nice complement to Humphrey’s Backstage schedule (which is now a mix of blues on Mondays & R&B on many Thursdays and Sundays – along with their predominantly jazz calendar). We seem to have more R&B bands getting booked this spring, which suggests the venues are getting more people out for that. I’m hoping we will see a trend back to more blues in the summer. One other trend, that is drawing a nice crowd, is the 2-5pm blues at Hennessey’s/SpeakEasy. This past weekend was the Youth Blues Jam, which is always impressive, and this coming Saturday we will have John January & The Rare Creed!